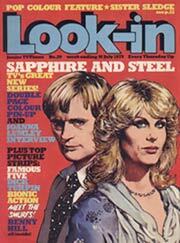 i was in hmv today looking at the boxset of the second series, and was falling about laughing looking at the synopses, one of them was almost verbatim 'Sapphire and Steel arrive at a petrol station. Meanwhile, characters from several periods in history appear and start acting suspiciously'! I'm starting to like it so much I might have to not watch it, so as not to be disappointed! That's Adventure Six, the last one ---- just watched it yesterday! An absolute classic. I don't think you'll be disappointed. They do exactly what it says on the tin. Yeh, Nick, I remember you mentioning Look In in this post (http://gutterbreakz.blogspot.com/2003_10_01_gutterbreakz_archive.html). That reminds me, I've got to post something on Children of the Stones sometime soon.